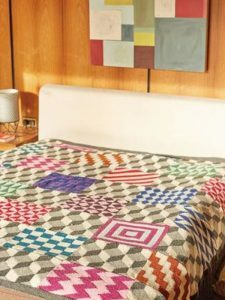 Inspired by bold geometric tile designs, Kaffe Fassett and Rowan Yarns has created a KAL project that allows knitters to do colourwork in small, manageable squares, with most only using two colours of yarn per square. The patterns for the squares are written for the Intarsia technique. The final, finished afghan creates an iconic Kaffe Fassett-look without any complicated colourwork. The layout of the squares flows around Kaffe’s instantly recognizable Tumbling Blocks design. Each square is then placed to achieve the maximum impact from the geographic square designs. Rowan Pure Wool Superwash Worsted – 100% machine washable wool.